Berry Metal Company is recognized as the world’s leading designer and manufacturer of technologies for the Iron and Steel Industry. 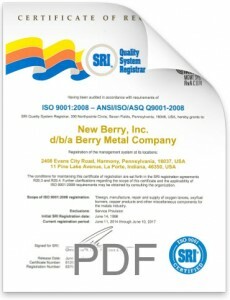 Over its 60 plus years in business, Berry Metal has earned a strong reputation for continuous development, quality products, dependable deliveries and knowledgeable repair services. Our R&D and engineering staffs have developed 49 patents related to product innovation and improvements to process enhancements, and our service and sales departments have over 200 years of experience service the iron and steel industry. The idea remains the same as ever – to serve existing and new clients as a trusted value-added provider of new innovations to help improve efficiency, lower costs and increase throughput in the steelmaking process. We are all about advancing breakthrough technology to our clients. Berry Metal Company’s goal is to deliver tomorrow’s technology for companies to use today. Solids/Oxygen Injection Lances, for BOF, Q-BOP and EAF furnaces. The second Berry Metal Company incorporated by Walter Berry Supplied oil seal rings for hot strip mills using “Berry Metal.” Doubled the life of the old rings. 1st cast copper lance tips for the open hearth steelmaking furnace. 1st multi hole copper lance tip in a BOF in the United States. (“Elephant Foot”). Trialed at Great Lakes Steel. Survived numerous acquisitions and mergers before being purchased by the current ownership in 1983. Supplied post combustion lance tips for the BOF. Started conversions of lances to post combustion distributor lances. Allowed shops to increase scrap charges and reduced slag accretion on lances. Supplied 1st US manufactured forged face tips. Doubled the life of tip assemblies. Alliance established with Falcon Foundry to combine engineering and product capabilities to expand into new markets. Developed double locking refractory system for blast furnace staves. Without follow-through service, a sale is little more than a simple transaction. The customer orders, the provider delivers the product, and each goes their separate way. Sales like this have no long-term benefit to either party. They do not lead to loyalty or long-term relationships. With true follow-through service, however, customer loyalty and long-term relationships can flourish. Great service, relentlessly practiced and flawlessly delivered, creates an environment where customers choose you first. They believe in what you promise. They buy not only on price, or only on quality, but on trust. These kinds of sales build mutually beneficial relationships, which in turn build long-term success for everyone involved. That is why Berry Metal has always practiced an approach of treating service at least as important as – and perhaps even more important than – the initial sale. That is also why Berry Metal today delivers an even higher level of service through its commitment to bringing the latest technological breakthroughs to clients. Backed by ISO-9001 Certification, we go beyond standard service levels to provide ongoing technical and engineering product.